Lightroom is fast becoming Adobe’s photo editing software of choice. Certainly speaking to people at this year’s Focus on Imaging, it’s one of the most widely used programs out there in the amateur/professional photography, image editing markets. Lightroom is designed specifically with photography in mind, allowing users to manage large amounts of digital images. Effectively, it is one big database of images, allowing you to manage, organise and edit your images in once centralised place. From a photographer’s perspective, it focusses on following workflow steps, from library more through to editing and printing. The good news is that you can pick yourself up a copy of Lightroom for pretty good value. There’s a host of special offers available on the Adobe website, take a look here. And the better news is that when you do, you’ll be able to take advantage of the Nik Software Plug-in range. Nik Software Plug-ins does exactly that – they ‘plug-in’ to Lightroom to give you more options when in editing and development stages. As well as the traditional settings available to Lightroom users, installing Nik Software will give you a host of other styles and features to play with. The beauty with this is that something that could take considerable time to achieve using just Lightroom editing techniques – a certain style, noise reduction or specific colour effects for example – can be achieved in a matter of minutes. The Nik Software range is vast. We’ve blogged extensively on their products over the last few months, so it’s well worth having a look back atour posts to learn more about the range. Just click here. This entry was posted in Photography, Software and tagged Adobe, Adobe Lightroom, Image Editing, Lightroom, Nik, Nik Software, Photography on May 25, 2012 by colorconfidence. Color Efex Pro 4 – available in Select and Complete editions, Color Efex is the most comprehensive set of enhancements for colour correction, retouching and creative filters to quickly stylise your images. Silver Efex Pro 2 – the definitive plug-in for truly outstanding black and white images. Arguably their flagship plug-in, Silver Efex really is an outstanding addition to your workflow. HDR Efex Pro – the new benchmark for creating stunning, high quality and realistic High Dynamic Range stylised images. Viveza 2 – take control of light, contrast and colour in your digital imagery for fast, effective photo editing. Dfine 2.0 – a brilliant plug-in to reduce noise in your images, creating superior quality images without the loss of detail. The range plugs seamlessly into Photoshop, Aperture or Lightroom – meaning you can utilise them in whichever tool works best for you and your workflow. They all make use of Nik’s patented U-Point Technology too, allowing you to selectively apply adjustments to any area in an image with affecting the overall appearance. If you want a sneak preview of the power and versatility of Nik Software, the Snapseed App is a great way to get a feel for the Nik way of image editing. Snapseed is available on iPhone and through the Mac Appstore. We did an in-depth review of Snapseed back in January which you can read here. A few of us in the office are proud owners of the Snapseed iPhone app, and truthfully, you’ll struggle to find a better app for image editing on the iPhone! Go have a look… and get that phone out in the sunshine! This entry was posted in General News, Software and tagged Color Efex Pro 4, Dfine 2.0, Digital images, HDR Efex Pro, Image Editing, iPone App, Nik, Nik Software, Photography, Sharpener Pro 3.0, Silver Efex Pro 2, Snapseed, Viveza 2 on May 23, 2012 by colorconfidence. Colour management – Wikipedia will tell you this is the “controlled conversion between the colour representations of various devices”. And, broadly speaking, this is pretty much spot-on. Although we prefer to think of colour management from a practical perspective; how managing colour correctly throughout your workflow and various devices can improve your image quality, and perhaps more importantly – your own satisfaction! With this in mind, a few months ago we created two bundle items to help you start this accurate colour management process. 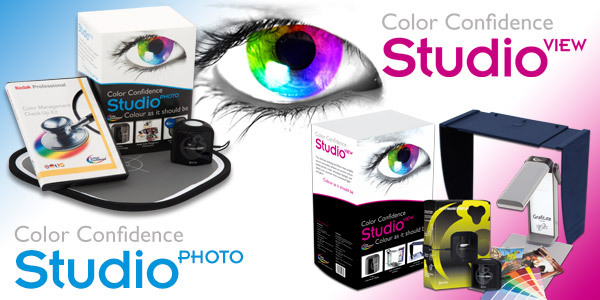 The Color Confidence Studio Photo & Studio View respectively combines various devices and solutions to set you on your way to achieving quality colour results. But what are they, and why do you need them? All in all, the Studio Photo is a great way to start achieving accurate colour from capture and on-screen, and to assess how accurately colour is produced throughout your workflow. The Studio View is a great way to create the right environment to start accurately viewing and reviewing colour. This entry was posted in Calibration, Color Confidence, Color Confidence Range, Colour Management, Monitor Calibration, Photography, The technical stuff and tagged Accurate colour reproduction, Calibration, Color Confidence, ColorMunki Display, Colour accuracy, Colour Management, Colour Reference, Grafilite, Image Editing, Kodak Check-Up Kit, Monitor Calibration, PcHOOD, X-Rite on May 18, 2012 by colorconfidence. This leads us nicely onto the art of photo editing. After you’ve taken that simmering shot which captures the moment perfectly, you may want to tweak or enhance it slightly when you get back onto the computer. Nik Software specialise in this image enhancement – helping you get creative with your images and get the best out of your shots. They offer a range of award-winning plug-ins for Photoshop, Aperture and Lightroom allowing you to stylise and adjust your images. Black and white, HDR effects, stylised colour enhancement, image sharpening and noise reduction can all be effortlessly achieved in the Nik Software range. You can view the range here, or read our previous blog feature exploring the Nik range here. And better still, throughout May you can save 10% off the Nik Software range on our website – so now you have no excuse to not edit your images to your heart’s content! Image editing also leads us onto another colour management query – the screen you use to view your images. A colour accurate display is essential for accurately viewing colour reproduction on-screen, lending itself nicely to the art of image editing. When using the likes of Nik software, it is useful to use a display that reproduces the image as closely as possible. This means you can edit in confidence knowing your edits are being portrayed correctly. NEC monitors in particular offer this high-quality, accurate colour display, with many using in-built calibration devices to ensure accurate display longevity. You can learn more about the NEC range here. This entry was posted in Monitors, Software and tagged Image Editing, NEC, NEC monitors, Nik Software on May 11, 2012 by colorconfidence.